← Jumanji: Welcome to the Jungle is Actually Pretty Great! To be entirely honest, I don’t really consider DC Comics to have a solid continuity anymore. After muddying up the main continuity with the New 52, and then rejecting parts of their New 52 continuity with Rebirth, I think DC has settled into just telling general stories about their superheroes with the occasional crossover. The less said about how far they bent over backwards to give us our current Superman the better. But whatever continuity DC is peddling these days, we can at least know that the Wonder Twins exist! Is that really the best place to be making out with Plastic Man right now? That is a panel from Batman #37 out this week. Batman, Superman, Catwoman and Lois Lane are on a double date to a local county fair. But it’s superhero night and everybody in attendance has to go in superhero costume. And the two people in this panel have chosen to go as the Wonder Twins! 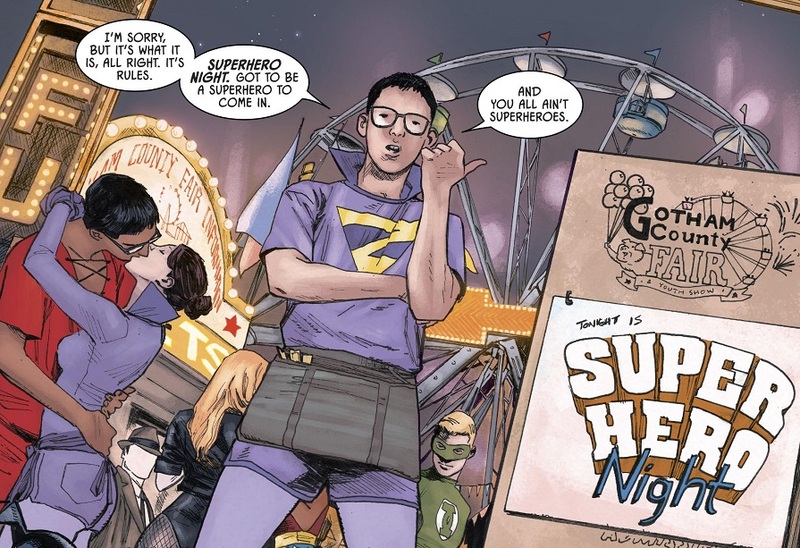 So even though we haven’t seen the Wonder Twins in person since at least the New 52 relaunch, they clearly exist in this world. And they are prominent enough that somebody made costumes about them. As I’m sure you’re aware, the Wonder Twins did officially exist in the Pre-52 continuity. They debuted in the Extreme Justice series in the 90s, complete with new backstories and everything. Those incarnations haven’t been seen much since, but I think the main Batman comic is a pretty solid benchmark for what is and what isn’t in continuity, amiright? So yeah, the Wonder Twins are a thing. Just felt like pointing that out. Posted on December 21, 2017, in Batman, Comics, DC, Superman and tagged Wonder Twins. Bookmark the permalink. Leave a comment.